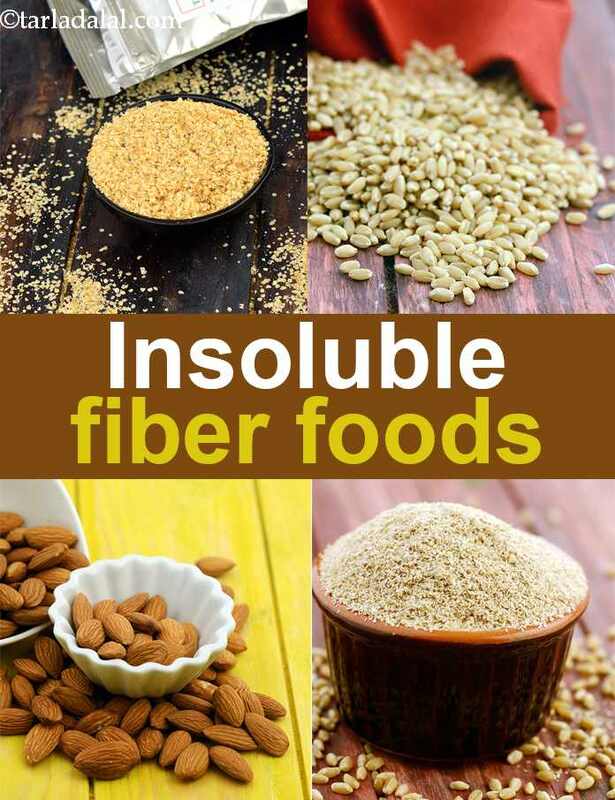 Insoluble Fiber Foods, Insoluble fibre Food List + Recipes. Dietary Fiber is a plant based nutrient also known as Fibre or roughage. Plant based nutrients come from fruits, vegetables, whole grains, dals and tubers. There are two parts to it, Soluble Fibre which is sticky and dissolves in water and insoluble fibre which does not dissolve in water and goes through your stomach without being broken down. Insoluble Fibre does not dissolve in water and goes through your stomach without being broken down. In fact, it helps other foods move through your system and out. Insoluble Fibre improves your digestive system and keeps you healthier. When you have a runny stomach or diarrhoea then cut Insoluble Fibre. So reduce consumption of rice, wheat, almonds, peanuts, cashew nuts. You must have fibre with water to deal with constipation. You can carry a handful of almonds with you or keep some homemade almond butter at hand at work or home to have a healthy snack. If you are lactose intolerrant then nothig better than homemade almond milk. For rajma lovers, make some rajma, rajma curry or have a rajma bean sprouts salad. Or there is the Puinjabi ever popular chole which you can have with bajra roti or there is palak chole to be had. 30 to 38 grams. The thumb rule is that for every 1,000 calories consumed you need 14 grams of fibre. 1. Prevents Constipation: It promotes regular bowel movement and prevent constipation. 2. Remove toxic waste through the body quickly. 3. Weight Loss : Insoluble fibre keeps you feeling fuller for a longer time and hence you tend to eat less. So eating healthy insoluble fiber leads to weight loss. Think about eating a refined food like pancakes, cookies and you just want to go on eating them. So up the fibre with rich live foods. 4. Prevents Colon Cancer : As insoluble fibre reduces toxic waste from our body quickly and prevents it from being digested in our body. It helps prevent colon cancer by keeping an optimal pH in intestines to prevent bacteria from producing cancerous substances. Enjoy our Insoluble Fiber Foods, Insoluble fibre Food List + Recipes and other related fiber articles.